Fingers crossed that we only have nice, warm months ahead. Here's a throwback to last summer on a beautiful day when I was walking around mid-center city taking in famous murals. Testing a New Theme Out in a Smaller Room before we roll the same design throughout larger exhibition rooms. We've had this large, beautiful piece as one of our mainstays in the lounge area of the Gallery over the past year or so. Hopefully this video does a bit more justice than past pictures I had posted. A large percentage of our clientele are musicians (or deeply love music, of course), so Galerie Hamid has always searched the Far East and elsewhere for sets of handmade, perfectly strung, drums. We just got this set of three a week ago. We're constantly testing various presentations of our pieces in Galerie Hamid. Right now, we're focusing on huge sculptures. This wooden turtle is a few hundred pounds and about 5 and a half feet tall. Many of our acquisitions completely overshadow tall men and women. Here is just one example of a beautiful flat Bakota statue that borders on 7 feet and is a few hundred pounds. It's been a long, cold spring. Come try on some of our most colorful North African Jewelry from Morocco for the ladies. Along with the same early summer/late spring style, check out these beautiful earrings. We've made a few major changes to the website to make it more user friendly, especially on mobile devices. You'll notice that you can't buy our items directly from this site anymore - we're now using ETSY exclusively as our selling platform. On Etsy we can take any type of payments now, and their checkout system is much smoother than what we had implemented. We now have time to focus on making this the best medium it can be for you to have a simple, elegant way to browse our art collection, which is updated regularly. Im not sure if they (the adjacent hotel & shops) do this every year, but the exhibit was wayyy cool. There were these mosaic style paintings, some animal sculptures, and some rad furniture next to the mini water-fountain. Check out the videos below to see the water fountain in action surrounded by the brightest colored furniture you've ever seen. 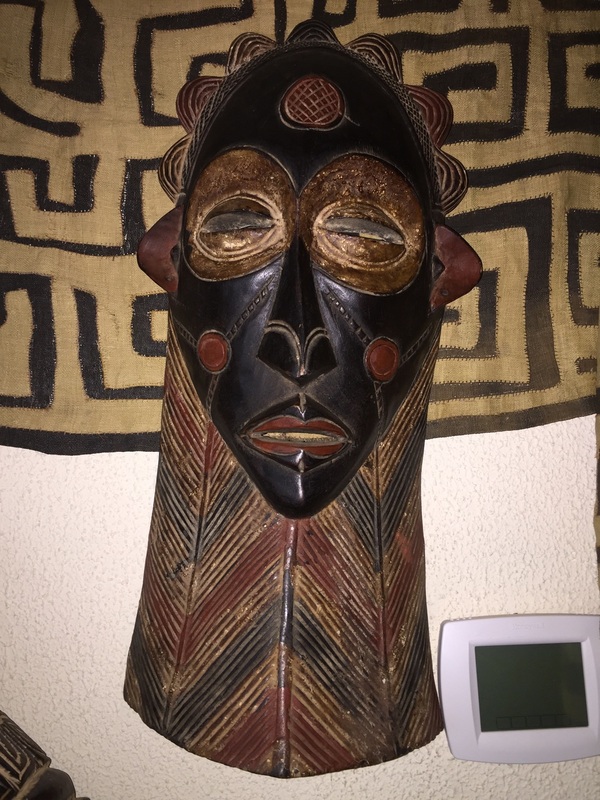 We're excited to to show you a preview of vintage masks (mainly from Zaire and Cameroon) that we'll soon have ready for exhibition and sale in our gallery. 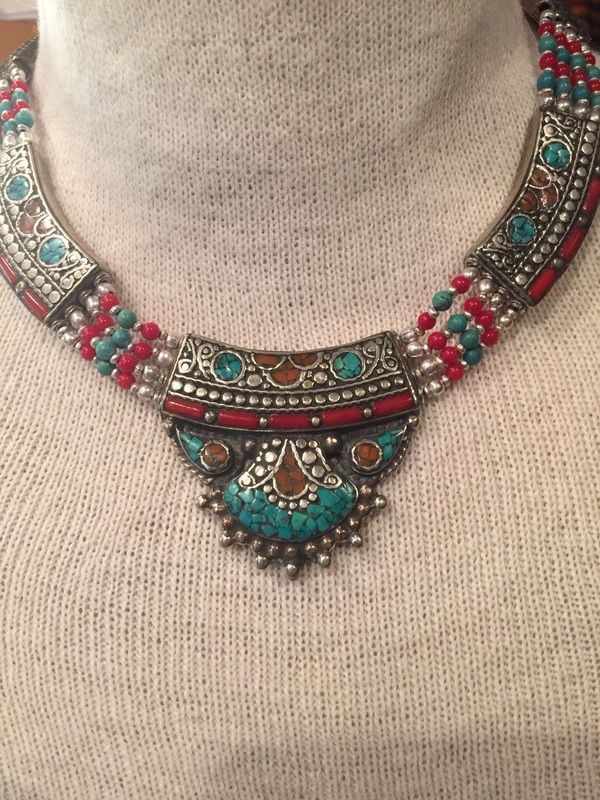 Although we have jewelry from many different areas of the world, some of our most colorful, unique pieces are from Morocco, shown below. Don't get too excited, It's not a full fledged tour of the gallery. But I don't usually post pictures of our interior, which has some really cool views, like the few below towards the main enternce. Although we don't ship many large paintings (due to obvious logistical issues), I still try to share what our newest collection of paintings/drawings look like. Here's two of many examples. Thanks for stopping the new Galerie site! Everything is basically the same as before--except for us using "galerieh" instead of galleryhamid.com. Not to worry-this is only temporary. We're switching web hosts, and with that comes delays and issues with transferring over the initial name, which is why we needed to use an alternate name in the meantime. Anyway, all the inventory is the same, and everything will start looking pretty real soon. You can buy from our online store here. Please shoot me any questions.